Die Martis, 10° Aprilis 1832. M. of Donegall v. Salt et al. Message to H.C. with an Amendment to it. The King v. Trafford et al. Wr: Err: delivered. Service of Process (Ireland) Bill. Liverpool & Manchester Railway Bill. Factories, Petition from Carlisle for regulating Hours of Labour in. Reform (England) Bill, Petitions from Kilsyth & Misterton in favor of. 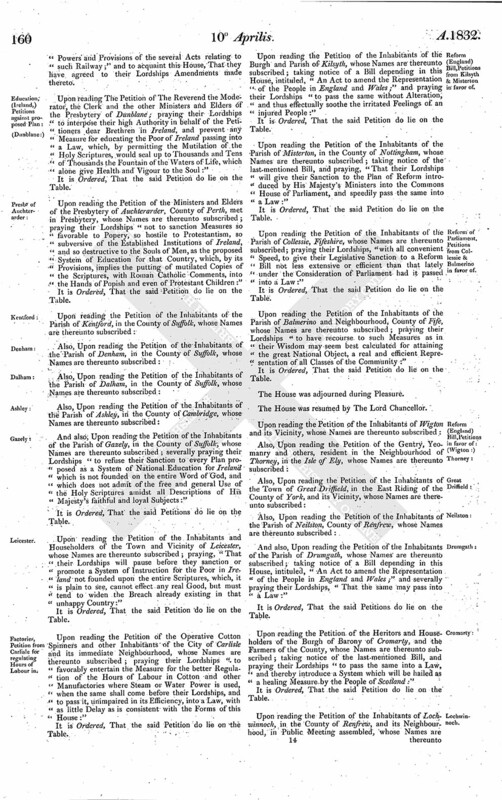 Reform of Parliament, Petitions from Collessie & Balmerino in favor of. Reform (England) Bill, Petitions from Leicester & Arundel against. Order in Council under Cholera Prevention Act delivered. Cuninghame's Estate Bill, Ld. Douglas sworn to give Evidence on. The Answer of John Stevenson Salt, John Towgood, John Ingram, James Strange, James Dashwood, Edward Howell, James Stevens and George Peacocke, Respondents to the Petition and Appeal of The Most Honorable George Augustus Marquess of Donegall, Appellant, was this Day brought in. Hodie 3a vice lecta est Billa, intituled, "An Act for more effectually repairing the First District of the Road from Coleshill, through the City of Lichfield and the Town of Stone, to the End of the County of Stafford, in the Road leading towards Chester, and several other Roads in the Counties of Warwick and Stafford and City and County of the City of Lichfield." Hodie 2a vice lecta est Billa, intituled, "An Act for constructing and maintaining a Pier or Harbour at Largs, in the County of Ayr." Their Lordships, or any Five of them, to meet on Thursday next, at Ten o'Clock in the Forenoon, in the Prince's Lodgings, near the House of Peers; and to adjourn as they please. Hodie 2a vice lecta est Billa, intituled, "An Act to continue until the Fifth Day of March One thousand eight hundred and thirty-three, and from thence to the End of the then next Session of Parliament, an Act of the Fifty-fourth Year of King George the Third, for rendering the Payment of Creditors more equal and expeditious in Scotland." Ordered, That the House be put into a Committee upon the said Bill on Thursday next. Upon reading the Petition of John Hamilton, Appellant in a Cause depending in this House, to which The Reverend George Bennet, and others, are Respondents; praying their Lordships, "That this Appeal may be amended by adding the following Persons as Respondents; vizt. Christian, Agnes, Jane, Ann, Andrew and David Bennet, Children of the said Reverend George Bennet; Miss Christian Spittal, residing at Dysart, for herself, and also as Executrix of the deceased Thomas Spittal, Ship Owner in Dysart; James Hutton, sometime Merchant in Dysart, now Accountant in London, and Andrew Scott, Writer to the Signet, his Mandatory; David Scott, Farmer at Northfield, Assignee of John Hutton, residing in Dysart; the said John Hutton and others, Executors and nearest of Kin of the deceased Christian Hutton, Widow of the also deceased John Pert, Shipmaster in Dysart; Mrs. Charlotte Dundas or Davies, Wife of Hart Davies Esquire, Commissioner of Excise in London, and the said Hart Davies for his Interest; Battersby, as in Right of Mrs. Elizabeth Grey Dundas or Battersby his Wife, now deceased; Mrs. Amelia Strachan or Richards, Wife of Richards Esquire, and the said Richards for his Interest; and Catherine Strachan or Carr, Wife of Carr, and the said Carr for his Interest; and that the said Persons may be ordered to put in their Answer to the said Appeal; and that Service of their Lordships Order upon them, or upon any of their known Agents in the Court of Session, may be deemed good Service:"
The Earl of Shaftesbury (in the Absence of the Lords with White Staves) reported, "That they had (according to Order) waited on His Majesty with their Lordships Address of Friday last; and that His Majesty was pleased to receive the same very graciously, and to say, He would give Directions accordingly." Thomas Joseph Trafford, Thomas Walker, Charles Walker, John Ledger, William Bancroft, William Bradshaw, Parker Raingill, John Moss, Edward Mason, John Holland, William Taylor, Robert Barlow and John Barrett are Defendants. The Earl of Shaftesbury reported from the Lords Committees, to whom the Bill, intituled, "An Act for extending the Time for completing the additional Bridge over the River Dee, in the City of Chester," was committed; "That they had considered the said Bill, and examined the Allegations thereof, which were found to be true; and that the Committee had gone through the Bill, and made One Amendment thereto." "Pr. 4. L. penult. Leave out from ("others") to the End of the Bill." The Earl of Shaftesbury also reported from the Lords Committees, to whom the Bill, intituled, "An Act for making and maintaining a Turnpike Road from Burnt House, in the Parish of Lympstone, in the County of Devon, to Exmouth, in the same County," was committed; "That they had considered the said Bill, and examined the Allegations thereof, which were found to be true; and that the Committee had gone through the Bill, and made One Amendment thereto." "Pr. 12. L. 31. Leave out from ("others") to ("And") in Line 32." With a Bill, intituled, "An Act to regulate for Five Years Road Tolls on Steam Carriages;" to which they desire the Concurrence of this House. With a Bill, intituled, "An Act to effectuate the Service of Process issuing from the Courts of Chancery and Exchequer in England and Ireland respectively;" to which they desire the Concurrence of this House. 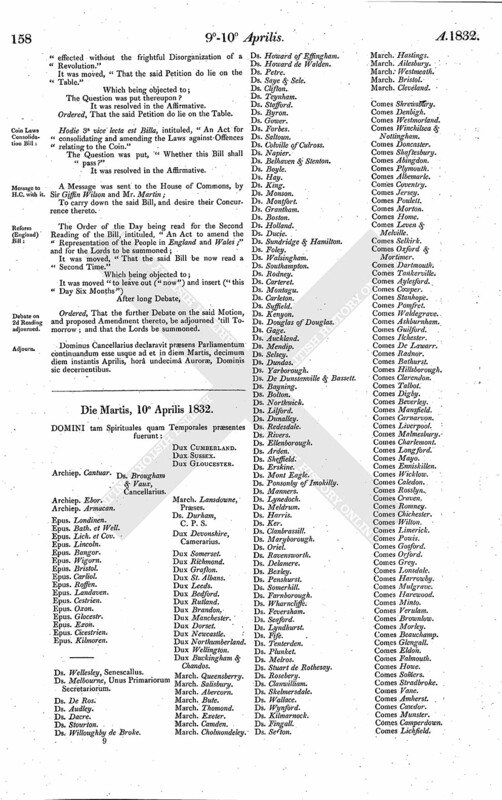 To return the Bill, intituled, "An Act for enabling The Liverpool and Manchester Railway Company to make a Branch Railway; and for amending and enlarging the Powers and Provisions of the several Acts relating to such Railway;" and to acquaint this House, That they have agreed to their Lordships Amendments made thereto. 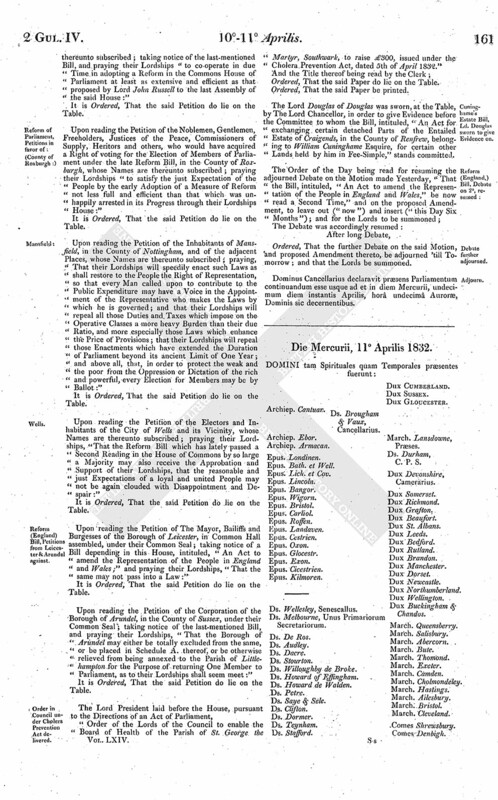 Upon reading The Petition of The Reverend the Moderator, the Clerk and the other Ministers and Elders of the Presbytery of Dunblane; praying their Lordships to interpose their high Authority in behalf of the Petitioners dear Brethren in Ireland, and prevent any Measure for educating the Poor of Ireland passing into a Law, which, by permitting the Mutilation of the Holy Scriptures, would seal up to Thousands and Tens of Thousands the Fountain of the Waters of Life, which alone give Health and Vigour to the Soul:"
Upon reading the Petition of the Ministers and Elders of the Presbytery of Auchterarder, County of Perth, met in Presbytery, whose Names are thereunto subscribed; praying their Lordships "not to sanction Measures so favorable to Popery, so hostile to Protestantism, so subversive of the Established Institutions of Ireland, and so destructive to the Souls of Men, as the proposed System of Education for that Country, which, by its Provisions, implies the putting of mutilated Copies of the Scriptures, with Roman Catholic Comments, into the Hands of Popish and even of Protestant Children:"
And also, Upon reading the Petition of the Inhabitants of the Parish of Gazely, in the County of Suffolk, whose Names are thereunto subscribed; severally praying their Lordships "to refuse their Sanction to every Plan proposed as a System of National Education for Ireland which is not founded on the entire Word of God, and which does not admit of the free and general Use of the Holy Scriptures amidst all Descriptions of His Majesty's faithful and loyal Subjects:"
Upon reading the Petition of the Inhabitants and Householders of the Town and Vicinity of Leicester, whose Names are thereunto subscribed; praying, "That their Lordships will pause before they sanction or promote a System of Instruction for the Poor in Ireland not founded upon the entire Scriptures, which, it is plain to see, cannot effect any real Good, but must tend to widen the Breach already existing in that unhappy Country:"
Upon reading the Petition of the Operative Cotton Spinners and other Inhabitants of the City of Carlisle and its immediate Neighbourhood, whose Names are thereunto subscribed; praying their Lordships "to favorably entertain the Measure for the better Regulation of the Hours of Labour in Cotton and other Manufactories where Steam or Water Power is used, when the same shall come before their Lordships, and to pass it, unimpaired in its Efficiency, into a Law, with as little Delay as is consistent with the Forms of this House:"
Upon reading the Petition of the Inhabitants of the Burgh and Parish of Kilsyth, whose Names are thereunto subscribed; taking notice of a Bill depending in this House, intituled, "An Act to amend the Representation of the People in England and Wales;" and praying their Lordships "to pass the same without Alteration, and thus effectually soothe the irritated Feelings of an injured People:"
Upon reading the Petition of the Inhabitants of the Parish of Misterton, in the County of Nottingham, whose Names are thereunto subscribed; taking notice of the last-mentioned Bill, and praying, "That their Lordships will give their Sanction to the Plan of Reform introduced by His Majesty's Ministers into the Commons House of Parliament, and speedily pass the same into a Law:"
Upon reading the Petition of the Inhabitants of the Parish of Collessie, Fifeshire, whose Names are thereunto subscribed; praying their Lordships, "with all convenient Speed, to give their Legislative Sanction to a Reform Bill not less extensive or efficient than that lately under the Consideration of Parliament had it passed into a Law:"
Upon reading the Petition of the Inhabitants of the Parish of Balmerino and Neighbourhood, County of Fife, whose Names are thereunto subscribed; praying their Lordships "to have recourse to such Measures as in their Wisdom may seem best calculated for attaining the great National Object, a real and efficient Representation of all Classes of the Community:"
And also, Upon reading the Petition of the Inhabitants of the Parish of Drumgath, whose Names are thereunto subscribed; taking notice of a Bill depending in this House, intituled, "An Act to amend the Representation of the People in England and Wales;" and severally praying their Lordships, "That the same may pass into a Law:"
Upon reading the Petition of the Heritors and Householders of the Burgh of Barony of Cromarty, and the Farmers of the County, whose Names are thereunto subscribed; taking notice of the last-mentioned Bill, and praying their Lordships "to pass the same into a Law, and thereby introduce a System which will be hailed as a healing Measure by the People of Scotland:"
Upon reading the Petition of the Inhabitants of Lochwinnoch, in the County of Renfrew, and its Neighbourhood, in Public Meeting assembled, whose Names are thereunto subscribed; taking notice of the last-mentioned Bill, and praying their Lordships "to co-operate in due Time in adopting a Reform in the Commons House of Parliament at least as extensive and efficient as that proposed by Lord John Russell to the last Assembly of the said House:"
Upon reading the Petition of the Noblemen, Gentlemen, Freeholders, Justices of the Peace, Commissioners of Supply, Heritors and others, who would have acquired a Right of voting for the Election of Members of Parliament under the late Reform Bill, in the County of Roxburgh, whose Names are thereunto subscribed; praying their Lordships "to satisfy the just Expectation of the People by the early Adoption of a Measure of Reform not less full and efficient than that which was unhappily arrested in its Progress through their Lordships House:"
Upon reading the Petition of the Inhabitants of Mansfield, in the County of Nottingham, and of the adjacent Places, whose Names are thereunto subscribed; praying, "That their Lordships will speedily enact such Laws as shall restore to the People the Right of Representation, so that every Man called upon to contribute to the Public Expenditure may have a Voice in the Appointment of the Representative who makes the Laws by which he is governed; and that their Lordships will repeal all those Duties and Taxes which impose on the Operative Classes a more heavy Burden than their due Ratio, and more especially those Laws which enhance the Price of Provisions; that their Lordships will repeal those Enactments which have extended the Duration of Parliament beyond its ancient Limit of One Year; and above all, that, in order to protect the weak and the poor from the Oppression or Dictation of the rich and powerful, every Election for Members may be by Ballot:"
Upon reading the Petition of the Electors and Inhabitants of the City of Wells and its Vicinity, whose Names are thereunto subscribed; praying their Lordships, "That the Reform Bill which has lately passed a Second Reading in the House of Commons by so large a Majority may also receive the Approbation and Support of their Lordships, that the reasonable and just Expectations of a loyal and united People may not be again clouded with Disappointment and Despair:"
Upon reading the Petition of The Mayor, Bailiffs and Burgesses of the Borough of Leicester, in Common Hall assembled, under their Common Seal; taking notice of a Bill depending in this House, intituled, "An Act to amend the Representation of the People in England and Wales;" and praying their Lordships, "That the same may not pass into a Law:"
Upon reading the Petition of the Corporation of the Borough of Arundel, in the County of Sussex, under their Common Seal; taking notice of the last-mentioned Bill, and praying their Lordships, "That the Borough of Arundel may either be totally excluded from the same, or be placed in Schedule A. thereof, or be otherwise relieved from being annexed to the Parish of Littlehampton for the Purpose of returning One Member to Parliament, as to their Lordships shall seem meet:"
"Order of the Lords of the Council to enable the Board of Health of the Parish of St. George the Martyr, Southwark, to raise £300, issued under the Cholera Prevention Act, dated 5th of April 1832." Ordered, That the said Paper be printed. 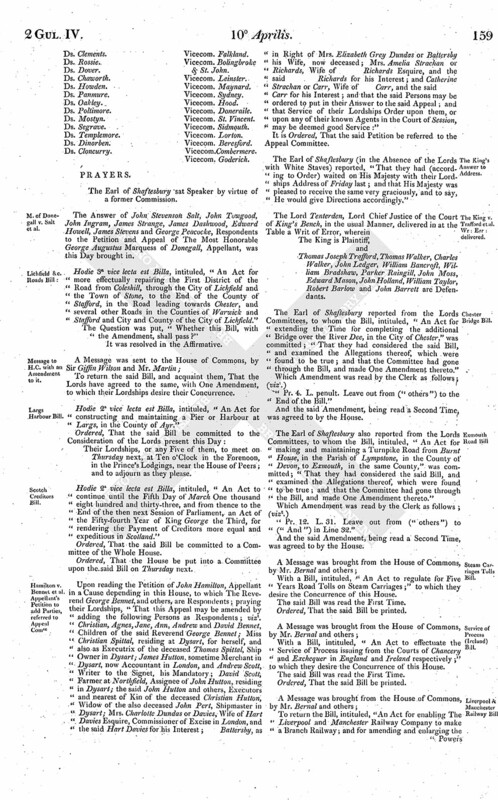 The Lord Douglas of Douglas was sworn, at the Table, by The Lord Chancellor, in order to give Evidence before the Committee to whom the Bill, intituled, "An Act for exchanging certain detached Parts of the Entailed Estate of Craigends, in the County of Renfrew, belonging to William Cuninghame Esquire, for certain other Lands held by him in Fee-Simple," stands committed. Ordered, That the further Debate on the said Motion, and proposed Amendment thereto, be adjourned 'till Tomorrow; and that the Lords be summoned. Dominus Cancellarius declaravit præsens Parliamentum continuandum esse usque ad et in diem Mercurii, undecimum diem instantis Aprilis, horâ undecimâ Auroræ, Dominis sic decernentibus.